Kullervo Lahtela is one of the great but less known names of Finnish military aviation. Lahtela was a successful trainer and he prepared for war a number of young, enthusiastic, and above all highly qualified combat pilots, who performed with excellence in aerial battle. In the beginning of the Continuation War, Lahtela acted as a Flight Leader of the Flight Squadron 32. He was transferred for a Flight Leader of the Flight Squadron 34 on 11th February 1943, for a Flight Leader of the Fighter Squadron 30 on 16th February 1944, and for the Squadron Leader of the Fighter Squadron 32 on 23rd June 1944. Lahtela scored a total of 10 1/4 confirmed air victories, of which 5.25 were gained with the Curtiss Hawk 75, and 4.5 with the Messerschmitt Bf 109. When I noticed one of Lahtela's grandchildren seeking information of his grandfather in an Internet chat forum, I found out how the connections between the Virtual Pilots with Pilvenveikot, the society of Finnish war pilots, offered a good opportunity to interview Kullervo Lahtela's fellow pilots. I made the three following interviews by telephone. So it is time for Kullervo Lahtela to take his place in aviation history, apart from being another name in the record of aces. Interviews: Jukka O. Kauppinen "Grendel"
Transcription of Jaakko Hillo's tape: Seppo Tolonen. "Kuijje" Lahtela, he was my boss all the time while I flew the Curtisses, and the Messerschmitts in the final stage. And the Fokkers in the training stage at Siikakangas. He was such a fairly strict kind of superior officer that if he had anything to remark on, he gave it immediately. But as the war went on, we then became more or less buddies, and the boundary kind of disappeared. Even though I was a reservist, we sometimes partly shared accommodation. So he was a Commissioned Officer? Yes. He had graduated from the Cadet School. How was it with him, for example when he was a Fokker instructor? There had been even several jolly lads, but he was one of them and we did get a good training. Fokkers were old planes, you know. We started the Continuation War with them, when I got involved. But they were so slow already that we were always too late when ordered to scramble. Finally the Air Force Staff decided to swap them for Curtisses, and with them it was totally different. The Curtiss was faster and had better armament, which was still improved. We started to have success, but finally even Curtiss proved too slow. But we could do nothing about that. The tactics had to be changed. As for "Kuijje", I have nothing untoward about him. He was quite OK as a superior. What about him as a pilot of these various planes, from Fokker and Curtiss to Messerschmitt, was he good in handling them? Yes. He was quite a pilot and he did score kills. Sometimes even he made errors. Once he landed a Messerschmitt in Utti with the landing gear up, having forgotten them. But if I remember right, he had first needed to pull up again and circle the airfield. That's when he had to take in the gear and he obviously forgot about them in the second attempt. The first question: in which units have you served together? Obviously you have served in the same gang all the way. Yes. It was the Flight Squadron 32, and with the Messerschmitts the 34. Can you remember a battle you fought together with Lahtela? Just let me think. There must have been, but I cannot remember right now. As he was the Flight Leader, when we went in with a larger number then we flew on his flight or somewhere else covering the back. When the Squadron 34 had really hard aerial battles above Kymi, can you remember anything related to Lahtela? I'm sure there were incidents like the belly landing you mentioned. The belly landing happened in Utti. Sorry, in Utti of course. Now what were there. We had all kinds of fights and alarms and scrambles. If I remember right, he trusted me a lot, even if I was much younger. But I bound the enemy fighters... When the bombers had fighter escorts, I drew their attention to me so the others could shoot the bombers down. Kuijje noticed it and gave me praise. Lahtela trusted you to keep the escorts busy and focused solely on the bombers. Exactly. He had others on his wing, too. This I could recall now. He was the Fokker trainer at first. When he later was the flight commander, did the training continue on other plane types? It was pretty little. When we switched to the Curtiss, I got less than four hours of training before going to the front. It was even less with the Messerschmitt. Training was rather quick in the wartime. When you got used to the new plane, did you have time to practise for example working as a pair, or cooperation in combat? No, we had learned those already with the Curtiss. And we had practised patrol flights on the FR (Fokker D.XXI) already in peace time, so it was all familiar stuff already. Siinä koneelta toiselle siirryttäessä nämä taktiikat pysyivät samana? So you used the same tactics when you switched from a plane type to another? The tactics didn't change much, except of course the speed of the Messerschmitt took some adjusting to. Miksi Lahtela siirtyi pois lentolaivue kolmenelosesta? Karhusella on yksi versio, mitä muut ovat mieltä? Why did Lahtela transfer from Squadron 34? Karhunen wrote one version of the story, what do the others think? I don't remember that so well. I guess he transferred when we were at Malmi. There had been an incident in a restaurant, and that resulted in Lt Erinen and Kuijje having to leave. They had mouthed off at an invalid, drunk that they were, who then exaggerated the story. There was a complaint made to the Air Force HQ, which resulted in an investigation. Lahtela was one of the pilots bringing Messerschmitts from Germany. Did you ever go along? Not with him. I made one trip there with Captain Puhakka. I'd like to hear more of these trips to Germany, even if you didn't go there together with Lahtela. Have you perhaps heard anyone tell a story, that hasn't been published in a book? Guess there aren't any stories because all the trips were successful. Even if our guys were stubborn. When the Germans advised them for example to go around the Alps and the higher hills, the guys flew straight over. Fortunately the weather was good and they got over them all. I have no other memories of this. Well, there were little incidents every now and then on the way. For example in Königsberg they had to fix an engine a little, and some flew alone. And in Estonia there was a quarrel with a German air field officer, who was having a bad day. Editor's note: this might be Väinö Pokela's experience, also documented in these pages? But I guess Kuijje wasn't on the flight with the engine mishap, when someone was left behind and had to fly alone. And of course there were some who didn't know the language, they caused trouble of course. How did you cope without common language? You don't happen to know of the incident, when the canopy of Lahtela's plane opened when taking off from Riga? The flight had to land back there, and Lahtela's jacket fell in the Bay of Riga. They were fishing it up then. Yes, I heard his jacket dropped there. But I don't know if they even tried to get it back. The opening canopy was a weakness of the Messerschmitt. It could open if you didn't close it carefully. This incident is mentioned briefly at Fighter Tactics Academy in Mauno Fräntilä's article Messerschmitts to Finland. This goes now beside the point, but our society did an autumn visit to Jyväskylä to the Tikkakoski museum, a Blenheim visit. We had agreed with the curator to go to the storage area, that's normally closed from audience, to see the Blenheim there. After all there aren't many left in the world. Some Blenheim veterans came along from Tampere, and Eino Estama came from Oulu, he had flown the Blenheim and Junkers 88. Next we went to see the Me-109 and Kauko Aho examined it very close. He climbed even on the wing to see into the cockpit, and that's when he noticed the museum staff was looking the other way. Aho later told that, "I was thinking that I've never sat in the Messerschmitt, they never let us bomber pilots even near the fighters." He was very quick in jumping in the cockpit and closing the canopy after him. The museum man panicked and told him to not lock the canopy, "do you know how to open it from inside?" And Aho said, "No idea, I've never sat in a Messerschmitt." They worried that Aho might not get the lock open again, and it'd take time to open it with tools. It was really funny, there's even good photos of it. His wife had fun seeing his expression in the plane. But a couple of questions still. Squadron 34, 2nd flight, August '43. Lahtela's flight operated from Malmi. On August 23, Lahtela shot down a Boston at the coast of Estonia. Do you remember this incident? Oh yeah, I wasn't there, but I have heard of it. It dropped right at the coastline and Kuijje went later to see the place. Can you remember who was his wingman there? Then on October 10th, '43, Lahtela dropped a PE-2 at Porkkala. Do you remember anything of this? No, I wasn't there either. All kinds of things happened. One night, they had been drinking heavily. Next day we had watch, there was a scramble and we managed to score kills. Usually, when coming home after making a kill, we'd do a pull-up and spin over the home field. I watched on the ground when Kuijje do that, and I saw the plane begin to sink when he inverted it. It sunk and sunk and he couldn't make it straighten until at treetops. He was deadly pale when he landed and climbed out of the cockpit. He had forgotten to fasten the belts. It felt really uncomfortable. Terrible. He was lucky that day. But all in all, he was proper superior and competent pilot? Yes, he certainly did his job well. How did you know Lahtela, where did you serve? Lahtela was born in '13 or '14, if I remember right, and I was a young pilot, born in 1921, who came as his subject. First to his flight, later near the end of the war in the squadron he commanded. He was somewhere else inbetween. I was close with Kuijje outside flying, too. Kullervo Lahtela was his real name, but we all knew him as Kuijje. I arrived at Siikakangas in 1940. It is an airbase near Ruovesi, Tampere, that gave flight training. Lahtela was a flight leader there, I came as a student, and together we went to the Winter War and the Continuation War. In the latter, I was in the same squadron with him. But there was a time in between, when I was in the Cadet School and he in the Messerschmitt squadron. Then in '44 he came to command his old squadron. You flew the Fokkers in 1941? We began with the Fokkers, then in Summer '41 we got the Curtisses, American-made fighters that the Germans had captured. That's how they came to us. In '43 the Finnish Messerschmitt squadron was formed. Lahtela was the squadron commander there over a year, until he was transferred to the old Curtiss squadron. In '42-'42, when the Me-109's came, I was in the Cadet School. That was our war. Lahtela remained in service after the war, dunno how long he stayed. Whenever he became a civilian, he was a businessman with a company of his own. Looks like he retired in '48. That must be true. Then he began his own company that imported stuff from abroad. I kept intermittent contact with him, sometimes it was years when I didn't hear of him. Then in the 70's... Do you know when he died? Was it in the 80's? I think it was in early 80's. But then he had already left his company to his son. The government paid him pension, of course. I was in contact with him quite a lot in his final years. I can describe him as a pretty intelligent guy, proper for a pilot. He had the characteristics of a pilot, he had a vision of aviation and flight training. The training squadron got Major Ehrnrooth as commander in summer '41, he had been a test pilot. His previous position was the commander of the test flight squadron. So the squadron was very skilled, they took care of the flight skills and Lahtela was one who developed them further. What kind of visions? Did his training style differ from the usual or that of other squadrons? It was demanding to keep up the high level of skills. You had to be able to fly in tight formation, fly very close, and be exact in all flying. Of course the #1 squadron of the nation, Magnusson's squadron, had the same. But this, where Lahtela was a flight leader, was a training squadron, so these were stressed on and later in the war it could be seen in action. Kuijje Lahtela was artistic by nature. I have a painting of my dog that he made. He was skilled as a writer too, and debated flying matters with others. Very energetic, smart fellow. Did he paint or make drawings in the flight unit, too? I don't know when this side of him came out. This dog painting was made in his later years, close to 80's. He drew very well, you can see it in the way he wrote his signature. I haven't often seen like that, it's 'Kullervo Lahtela' drawn with thick line, rhythmic from beginning to end. I remember when I reported as his adjutant, he drew his signature and told me to study it, so I could sign his papers when needed. It took me a day to practise, I have no artistic skill. But I guess I learned it. He had three children. In the beginning of the Continuation War, his home was in Immola. The squadron staff HQ was there, so I visited there sometimes. I remember acting as Santa Claus to his little children in Christmas '41. I wore the pilot jacket inside out and had a pointy cap. After the war, did he continue as the commander of the 32? Yes, he did. It was changed to (squadron) 11 then. That was some administrative thing. The squadron was located in Pori then. What was life after the war there? It was poor kind of life for the armed forces. Lacking of resources. The army got little positive attention, after all we were supposed to be the losing side. Though later people have noticed that the work of the Finnish Army had been a great victory. But as I was saying, there were no big purchases then, pilots flew old planes until they started to be retired too. The number of planes reduced. But little weight was given to the activity then. In Pori, they flew the Curtiss. The squadron had had the planes all through the war and after, until they were retired. I think Pokela was flying from Pori, when his Me-109 had to make a forced landing. Yes, I know of this Pokela's landing, I know Pokela well. The gunnery exercises were conducted over the sea, and Pori was a waypoint during them. But as far as I know, Pori never was a Messerschmitt base. I know it happened outside Pori. After all I served in Pori until transferring to the test flight squadron at the aircraft repair shop at Tampere. Once I was a couple of days at Pori, pulling a target bag with a Blenheim. In '46, I think. But when did the Pokela crash happen? It must be the same time, could be the same exercises. I think it was Messerschmitts doing the gunnery then, but I can't remember the pilots. What makes it a remarkable case was that the plane ended up in a place where it could be easily recovered. The people of the Aviation Museum picked it up and are now rebuilding it. Yes, it was interesting. Do you know if they've got it ready by now? I guess they have. It's pretty much assembled now. It's on display in the museum, it was in the warbird exhibition. It looks complete already, a handsome Messerschmitt. I think they're still doing some touching-up. Pokela usually keeps the Pilven Veikot up to date with these things. Speaking of Pokela, did he fly into the target bag, or was it so that the bag came loose? He shot the bag with his machine guns, the rounds hit the locking mechanism and it came loose. The lead weight in the end pulled the bag upright, it became a big white wall he couldn't dodge. The sheet was pulled into the engine intake. That's how I've understood it. Pokela has told of the case too. I should ask Pokela if it was my Blenheim pulling it. Well, that's a different matter. After the war I was in contact with Lahtela. He was married at first, but his wife died. Then he married a woman called Sisko, and I spent more time with this new family. He had a cottage at Kaskinen, I was there once to eat crabs. It got rather wild there... He had a small motor boat that was pretty fast, and we raced it around some. It was fun. You already told that Lahtela was a good pilot. What kind of commander was he? He was an excellent pilot and visionary trainer. Well liked as a pilot and as a superior. He took good care of his subjects. As a commander he was a father figure of sorts. For example, we had a girl in the squadron cooking coffee and doing other such jobs, she was from somewhere in East Carelia. When the war ended, Lahtela got some official to write papers for her so she could stay in Finland. The way he didn't want to abandon the girl shows how he cared of the people he worked with. Myself, I got wounded in the legs in Summer '44 and was away until the end. Can you remember any flights together with Lahtela? When we were flying the fighters, we never flew together. One was always on the ground when the other was in the air. We flew single-seaters. Lahtela had been teaching in the Air Warfare School at Kauhava, where he had been a competent trainer. I think he spent his Winter War there, for some reason he didn't see combat action. 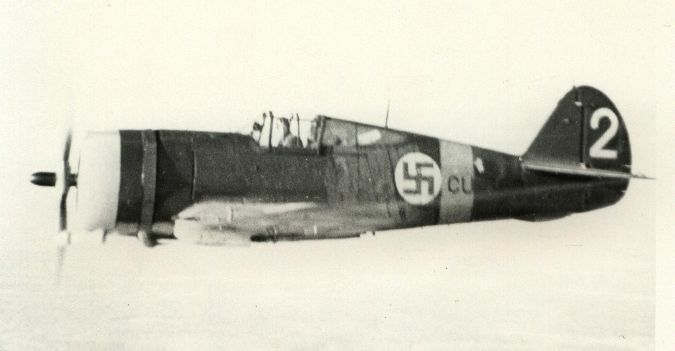 Then, at the end of the Winter War, the Squadron 32 was established in Hollola, though it had a different designation at first. My uncle had a farm there, and some of its buildings were used as lodging. But I digress. In any case it (Squadron 32) was established and Lahtela was moved there right away. They got Brewsters at first, I don't know how many they received before they were soon transferred to Magnusson's squadron. 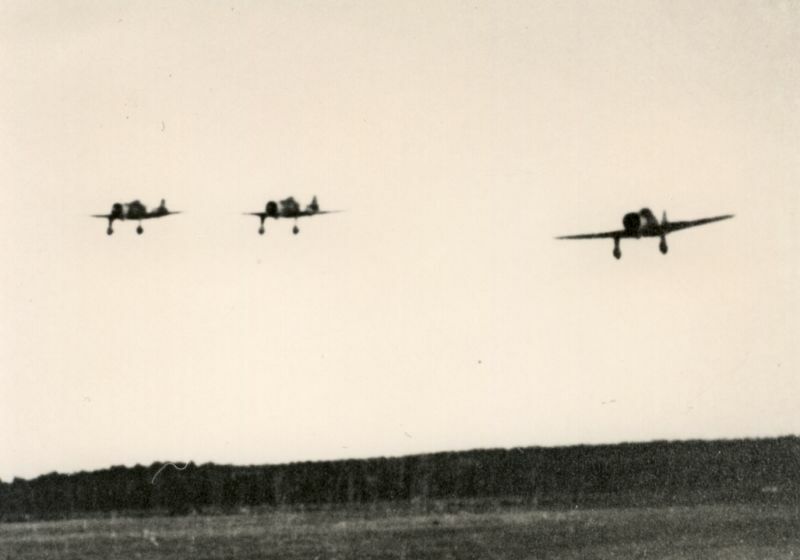 Squadron 32 got the old Fokkers in their stead, and they were used a lot for training. Combat flights with Lahtela? Yes, you see I wasn't in his flight, he was a flight leader and my leader was Captain Berg, he met his end at the Hanko front. In November one of our wings was at Hanko, the home base was at Nummela. Berg's flight, where I was too, went there first. It wasn't long when he got shot down. Lahtela took over and led, until Hanko was liberated. That was the time when I flew under him. Then, what happened next... I think Lahtela was the flight commander until I left to the Officer School in Summer '42. Though I spent some time in the Army HQ in the winter or spring. In any case he was professional in all his duties. I wonder if Lahtela ever told of his time in Squadron 34? I know very little of that. I know he was a flight leader in the Messerschmitt Squadron 34. Puhakka led one flight and Luukkainen another, Luukkainen later became the squadron commander. I dearly wanted to get to fly the Messerschmitt, but after the Officer School we were ordered back to where we had came from. So I don't know much of the Me squadrons. What I know is that Lahtela came back to Squadron 32 as commander, when Bremer was transferred away. Of course the Curtiss was obsolete by that time, but I don't think he otherwise mided returning to his old squadron. The squadron was located at the Uomaa base when he came. It was July 4th when the squadron was moved away. I was Lahtela's adjutant and we were the last to leave Uomaa. We went by car through Sortavala. The town was still peaceful, we found an open restaurant and dined there, we even got to Sauna. Then we continued to Mensuvaara, where the rest of the Squadron had already been moved. Mensuvaara was in the Uukuniemi community, near Sortavala, and now on the other side of the border. I'm not even sure of the place, it happened that when I, Commander Lahtela and the Radist Lieutenant Sarparanta arrived there, my flight got a mission. That was the flight when I got shot, so I never returned to Mensuvaara. I landed at Uomaa. When Lahtela returned to Squadron 32, were there still same personnel as when he left? Major Ehrnrooth, who commanded the Squadron 32 from '41 to '43, was given the command of the new Messerschmitt squadron, and took part of the Curtiss pilots with him. I'd say he got the better half. Of course the quality of the squadron dropped. But when Lahtela came back, and also the four of us who had been in the Cadet School, there was new backbone again. Of course there were new faces that had came over the years, but still it felt like coming home for him. I don't know of the time at Mensuvaara, when I returned to the squadron it was at New Year, when it was already moved to Pori. Why did Lahtela transfer away from Squadron 34? Joppe Karhunen has his version of the story, what do others think of it? If Karhunen were still with us, I'd like to ask him of his version. In any case it was because the position of the squadron commander was vacant, as Bremer was ordered as a liaison with the Germans at the Isthmus. That's how Lahtela explained it when he arrived to his old squadron. I think Karhunen was talking of the period when Luukkainen was the Messerschmitt commander and he got shot down. And there was the offer... I may be confusing things here now. In any case Luukkainen was shot down right before midsummer '44. Luukkainen came to command Squadron 34 on March 29, 1943 and Lahtela to Squadron 32 on June 23, '44. Oh, Luukkainen came so early. Well, that must be true. But who was that one flight leader then... Oh well. But as I was talking of Lahtela's return, he was intended to command the Messerschmitt squadron. But as he had already been assigned to the Curtisses, he didn't want to switch any more. It was something like this that Lahtela himself told me. And Lahtela came to Uomaa at Midsummer, '44. I recall we did a survey flight the night he arrived, he wanted to see the front line and the situation there. This was my story of his arrival. Karhunen may have had his own version, my only source was what I discussed with Lahtela, I've never spoken of this with the Messerschmitt men. I checked from another source, it says here that Luukkainen was shot down on June 19th. So there was only four days between, Luukkainen gets shot and four days later Lahtela came to the 32. 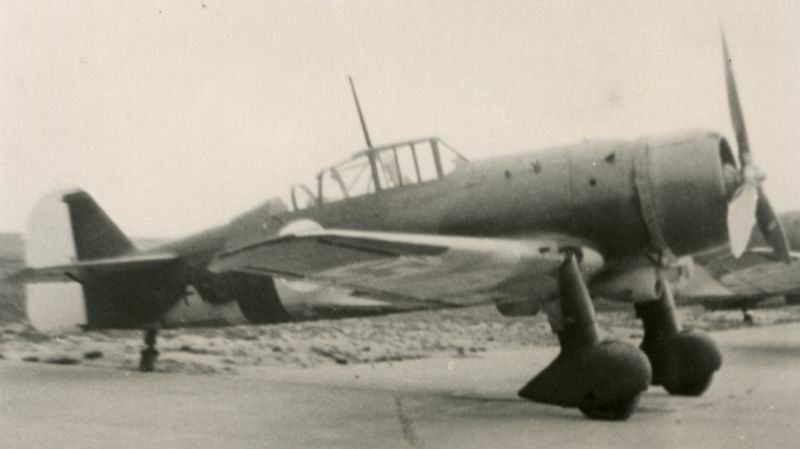 In February '43, during the first trip to get Messerschmitts, Lahtela's canopy opened at take-off from Riga. The planes landed back on the field, and I heard also that his jacket fell in the Bay of Riga. They went to fish it up then. Did he ever tell you of it? Must have been a good jacket. Well, it was a leather jacket after all. We used to buy them at Friitala. Did he tell of the trips to Germany? He told something of their stay in Vienna. They received at least some of the planes at Wiener-Neuestadt, which is south of Vienna. When spending their nights there, one of them had walked over the arc of a bridge over Donau, dunno if it's true. Stories like that. They were sort of initiation trips. I did a couple to Düsseldorf, when picking up the Curtisses. Flying and navigation in Germany is a lot different from that in Finland, here we knew all the railways and used them in finding places. On the other hand, we have terribly lot of lakes, so you can't really use those for orienteering. In winter you couldn't even see them properly. But in Germany, the lakes were few and they were good waypoints. Railways were so many that you couldn't keep track of them all. The few Autobahns were better guides. I'm no authority on these Messerschmitt flights, but I seem to recall that the group got apart somehow. The first batch was a big bundle of planes, the group was led by Major Ehrnrooth. But getting lost in Germany wasn't lethal, there were so many fields that you could usually find one to land. But I shouldn't speak more of what I don't know of. All I can say that he was a nice guy and it's a pity he had to leave this world so young. How about you yourself? I'd like to hear more of you and your time with the Curtiss, I see you were a flight captain after the war. I left Squadron 32 to Squadron 11, then to the test flight squadron at the Aircraft Repair Shop on autumn '45. Spring '47 I came to Finnair and stayed there until '73, that's 26 years and some. Many war pilots did the same. Karhila was one, too? Yes, Karhila was a squadron mate of mine from the Curtisses. And he was one of those who didn't go to the Officer School but flew the Messerschmitt. He came to Finnair at the same time with me, in '47, as did Olli Kepsu who recently passed on, and Kalle Juurikas. The four of us came there together. I retired in '73, having served my time. I spent a couple of years flying abroad, and after that I've spent these pension days. This young generation is interested in these things. The children of us pilots weren't so much, of course they've heard a lot from us, their fathers. But this next, the second generation, is terribly hungry for knowledge. In general, the respect of the old matters has increased a lot. There is still some time to do these reports. Initially he served in the Amphibious Flight Squadron 5 in Sortavala, but after that he did a giant effort in the Aviation School at Kauhava, in 1938-1940. In '38 I was at Kauhava and in the Reserve Officer School, but not as Kuijje's student. He was very skilful pilot, precise like in all his handcraft. I remember one little detail from the wartime. There was a shortage on footwear, and Kuijje made high-heeled shoes for Maija of wood, with wooden soles and cover of paper canvas. They had hinges in the soles, they weren't Dutch-style wooden shoes. He did that kind of delicate works with his hands. Jaakko Hillo thought of Lahtela as an artistic penman. Yes, his penmanship was beautiful, both writing and drawing. He was very skilled. He used to make drawings and paintings, at least after the war? Did he do any of those during the war? I think it was only after. We had one Captain Visapää in the squadron, who was good in drawing caricatures of the guys. Lahtela drew such situations too. Very artistic. Then he came to Squadron 32. The squadron was established at the end of Winter War, and we moved to the air base at Siikakangas, at the border of Juupajoki and Ruovesi. Siikakangas was just a clearing in the forest, there were no buildings when we went there. The planes were old Fokkers from the winter war, and some Wasp-Fokkers that were license-built in Finland. Their engine was different. There were no lodging buildings either, so we were accommodated at the forestry institute at Hyytiälä. The student apartments were good, they were empty and the whole squadon was lodged there, us officers too. The regional forester Jarl Strömmer was the highest chief in Hyytiälä and most of the officers lived in his home. They had a big apartment there. Our chief job was to give training to young pilots, who came from the basic course given at Kauhava. We gave the fighter training. That's what we did until summer '41. Then began the extra rehearsals before the Continuation War, so we armed the planes with machine guns and the squadron was moved to Hyvinkää. Karhila must have told you of that time. He made exact diary of every day of the war. Many writers have used his memoirs, Joppe Karhunen among others. All I have are memories, I've put nothing on paper. I don't know how many kills Kuijje got, but we were in the same squadron all the time in 1940-41. In 1941 we moved to the Isthmus and were there to cover the advancement of Colonel Pajari's 18th Division, covering his action and doing recon. One wingleader followed his spearhead all the time with radio as a liaison, and was in contact with the command centre in Lappeenranta and with the planes too. The advancement took a month, for our squadron it ended in air battle at Valkeasaari, in August 30 when the old border was reached. Then we were moved to Nurmoila, Lahtela was the squadron commander, until he was transferred to the Messerschmitts, was it summer 1943? Karhila and Leino know that. He went to Squadron 34, when it was established and received the fighters from Germany, and spent some time there. But when Major Bremer, the Commander of Squadron 32, was transferred to the General HQ, Lahtela returned to command Squaron 32. At that time the squadron had backed from Nurmoila to Uomaa, it was near the end of the war. From there the squadron moved to Mensuvaara, and stayed there until the peace declaration at September 4th. When we moved to Pori, we rented a German-built barracks from the Defence Ministry. It was at the edge of the airfield, actually at the railway yard. Kuijje and I, we fixed it and lived there. There was a corridor going through in the middle, and the Lahtelas lived on one side and we on the other. Both kitchens were in the same end, when the wives were cooking they kept the doors open and chatted. We spent a lot of time with the Lahtelas, they were good family friends. You mentioned that Lahtela had steady hand as pilot. What kind of commander was he in different squadrons? He was very liked as a superior. Honest and fair. How about his time as a trainer at Kauhava? I have the cadet matricle open here, I wouldn't have known it otherwise but it says here that he was a flight trainer in the Air Warfare School. It is a demanding duty, giving a future pilot his first lessons. He was in the school from 1938 to '40. Can you remember any air battles together with Lahtela? I had none, we were always in different wings. Never together. Do you have any idea why Lahtela transferred away from the 34? All I know is that Major Bremer, was transferred to other duty and we were left without a squadron commander. Did Lahtela ever mention shooting down a Pe-2 at Porkkala on October 10, '43? We had one flight at Hanko in '41, with Captain Berg as the flight leader. He was shot down the first day, and Lahtela took his place. It didn't take long then before the Russians withdrew from Hanko, and the flight could leave the area. But that was '41, in spring '42 we moved to Nurmoila. What was life in Pori like after the wars? In Pori we had the Myrsky, that was completed just before the withdrawal phase of the Continuation War ended. The first Myrsky's came to Flight Regiment 1, where I served. We did their first war flight on August 28. Two groups of six planes were in the air, but Lahtela wasn't there. Then the war ended, the armistice came in September 4, but we could take the planes with us to Pori. There Lahtela and I served in Squadron 11, Lahtela as the squadron commander, me as a flight leader. Squadron 13 was there too. Both squadrons had the Myrsky. There were some Curtisses left too, but they were taken little by little to Kauhava as trainers. The Mursky was our primary equipment, and we also had some Messerschmitts as practise planes. Our flight activity was limited due to fuel shortage, but we did our best to fly and maintain our skills. We were in Utti once, the Military Academy visited there and planes of all fighter types were ordered there. Lahtela flew a Curtiss, I came with Myrsky. Pekuri was there with a Messerschmitt and Aulis Bremer with a Morane. These we had to show to the students. First we told of the planes' capabilities in the ground, then showed trick flying over the field, with low rolls, spins, and so loud an immelmann the plane could. Were you in Pori at the time when Pokela crash landed the MT-208 Messerschmitt? There were many war pilot courses, and other courses after the war. Just day before yesterday I received one pilot's memoirs from the Pilot Course 15, I went to interview him on his 75th birthday. He's one of our veterans, though he wasn't in the war himself. He's a supporting member of the war veterans. You see, I'm the chairman of the war veterans of Nurmijärvi, so I have to go and congratulate these guys. Tomorrow I'm going to give the final farewells to one, and to set the wreath on his grave. He wasn't from the Air Force, but from the Army. I'm the only pilot in the veteran society of Nurmijärvi, there are no other combat pilots. And all these veteran brothers must be taken to their final rest. That's how it is. I also do my best to take a wreath from myself and on behalf of the society, as I did to Joppe Karhunen. Well there... Were there members of the Pilven Veikot at Joppe's funeral? Pretty great service, don't you think? Karhila, Kymioja, Pokela.. Those were that I knew. And others too. Yes, impressive. I was there personally for the first time. I remember Kalle Temmes' funeral at the Temppeliaukio Church. There were two rows of six veterans on both sides of the coffin, the front rows had roses. Then the Finlandia hymn played, and the roses were set. Everyone stood up. This is the last service. I became a commercial pilot at Aero on January '48, but Lahtela stayed back at Pori. That's when we went on separate ways. Of course I and my wife went to visit them there and here in Helsinki many times, and they visited us. But this flight connection broke. I spent 25 years at Finnair as a pilot. My aviation history began on spring 1938, in the Reserve Officer School. Then through the Officer School to the Continuation War. From there to Finnair, where I stayed until the last day of 1972. That's when I retired, in February I went to work in the Aviation Government and was seven years there as the grand inspector of flight activity. 40 years I earned my living from aviation, and still do in the form of pension. I've been retired soon 30 years, after flying 25 years at Finnair. This page contains the interviews with Kyösti "Kössi" Karhila, Jaakko Hillo ja Jarl "Kille" Arnkil, concerning Kullervo Lahtela. The interviews were conducted by phone and transcripted from audio tapes. Plane photos from the collöections of Virtuaalilentäjät ry.